Posted by grhomeboy in Arts Events Cyprus, Music Life Greek. The Chris Byers Jazz Quartet are performing a concert in Nicosia on Tuesday March 11. The U.S. Embassy and the Cyprus Ministry of Education and Culture are presenting the Chris Byars Jazz Quartet at a concert in Nicosia on Tuesday night. The performance is part of the ‘Rhythm Road: American Music Abroad Programme’, administered by the United States Department of State and Jazz at Lincoln Centre. As part of the programme, the Byars Quartet is currently on a 29-day tour to Slovakia, Saudi Arabia, Cyprus, Montenegro and Slovenia. Tuesday’s performance takes place at the ARTE Cultural Centre on Leonidou Street in Nicosia at 8pm. A sketch from the notebook purported to have belonged to van Gogh. Who could have imagined that a Greek woman could have caused such a stir in the international press and the Van Gogh Museum? The first to break the news was the BBC’s Greece correspondent Malcolm Brabant. According to the story, a writer named Doreta Peppa has in her possession a sketchbook belonging to Vincent van Gogh with sketches, some of which are signed “Vincent”. Other prestigious news services followed suit: Reuters, the Daily Telegraph, the Dutch television channel Nederland 1, and more. The story is as follows: Back in World War II, Doreta Peppa’s father, Meletios Peppas, a partisan, along with a group of other resistance fighters, raided a Nazi train carrying looted works of art, grabbed what they could and then stored the items in a safe place. Some 30 years after the death of her father (in 1973), Doreta discovers the wonderful sketchbook among her father’s manuscripts. The book is stamped with the words Royal Academy of Art, Brussels. She cannot believe her eyes. She shows it to her friends. Then she takes it to the head of conservation and restoration at the Greek National Gallery, Michalis Doulgeridis. “She had it wrapped in a cloth and asked me to take a look at it”, he explained after the event. “What is it?” I asked. “You tell me”, she said. “Will you look at it?” Everything pointed to the work of a great artist. “You have to investigate this” I told her. Athens-born Peppa (1963), an art collector and president of the “Ellin.a.is” foundation for ancient Greek religion, believes the sketchbook to be a diary kept by the artist, which he intended to give as a present to his brother Theo. Her research, which has been published in a book that was launched at Zappeion Hall in late February, takes a novel approach to the work of the artist. According to Peppa, van Gogh hid within his works letters, numbers and symbols representing valuable lessons that he wanted to pass on to mankind. The sketchbook was authenticated for Peppa by a young artist called Athanasios Selia, a photograph in the book was said to be of van Gogh by a dentist called Dimitris Berdelis, and Peppa’s book was published by Giorgos Alexelis of Epos Publications, who is co-author and Peppa’s husband. The sketchbook may be authentic or it may not. Only an expert can be the judge of that and, even then, there would be a margin of error. The Van Gogh Museum, after an initial series of contacts with Peppa, has now severed all communication. A spokesperson for the Museum told the Daily Telegraph’s Damien McElroy (January 4, 2008), “We get quite a few requests for authentication from people who believe they have something by Vincent van Gogh”. Editor’s Note > Peppa made the news a few months back, when her religion group entered the sacred area of the Sanctuary of Olympian Zeus [Columns of Olympian Zeus], located in the centre of downtown Athens, to perform their so-called “religious” ceremony. Ellinais, or the Holy Association of Greek Ancient Religion Believers, was founded in 2005 by a group of polytheists. Doreta Peppa is their spokeswoman and high priestess, and accordingly an avid advocate of their belief. Its followers are causing a stir with ceremonies in old temples, in which they pay homage to the ancient gods from Apollo to Zeus. Other than that, I strongly believe, that Peppa, is trying to stir the motions and the publicity news! Posted by grhomeboy in Arts Events Greece, Fashion & Style. For the seventh consecutive fashion season, the Hellenic Fashion Designers Association (HFD) is organizing the Athens Collections InStyle, Greek fashion week. 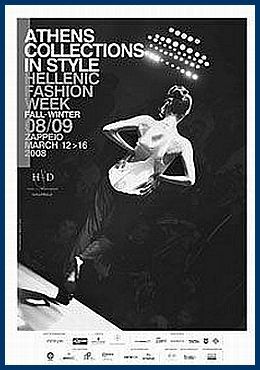 Under the auspices of the City of Athens, the Ministry of Finance and the Ministry of Development with the InStyle fashion magazine acting as communication sponsor, the seventh edition of Greek Fashion Week showcases the collections for Fall-Winter 08/09. The runway shows will take place at the Zappeion Hall from March 12 to March 16. French designer Chantal Thomass, a pioneer of glamorous, sensual lingerie, is the fashion week’s special guest star. Besides running her own brand, Thomass has also collaborated with Wolford and Victoria’s Secret. The Association and its members have come a long way – creatively, of course, but also in their continuous efforts to keep the fashion week alive via state and private financial aid. While a variety of private sponsors continue their support, the event is counting on the help of the Ministry of Finance, the Ministry of Development and Technology and design center ELKEDE. Also taking part in Greek fashion’s development is the Hellenic Foreign Trade Board. On the international front, buyers are expected from Italy, France, the Netherlands and Turkey as well as from Harvey Nichols Hong Kong. As for the international press coverage, participation includes fashion publications, websites and television channels from France, Germany, Spain, Italy, Egypt, Russia and the United States. Participating at the 7th Athens Collections InStyle are the following Greek designers: Angelos Bratis, Andria, Aslanis, Chara Lebessi, Christos Costarellos, Costas Faliakos (by Christos Petridis), Daphne Valente, Dimitris Dassios, Deux Hommes, Fanny Voutsela, Filep Motwary, Frida Karadima, Katerinalexandraki, Katerina Karoussos, Kathy Heyndels, Konstantinos, Liana Camba, Loukia, Makis Tselios, Maria Mastori, Mi-Ro, Nikos-Takis, Parthenis, Simeoni, Smaragdi, Vassilios Kostetsos, Vassilis Zoulias, Vasso Consola, Victoria Kyriakides, Veloudakis, Yiannos Xenis and Yiorgos Eleftheriades. Over the seasons, a number of foreign designers have made Zappeion a catwalk destination. Participating this season are: Georgia’s Avtandil, Greek-Cypriots Afroditi Hera and Elena Antoniades (who is based in London) as well as Ramona Filip, the Romania-born designer based in Cyprus. Besides the runway, all participating designers will present their collections in a commercial exhibition area. Parallel events at Zappeion include photographic exhibitions by Mara Desypri and Stefanos Paschos. Greek fashion icon and photographer Desypri will showcase photographs from her recently published book “Self Portrait”, while Paschos will present “Nike”, a project inspired by the Athenian trireme, featuring actress Karyofilia Karabeti clad in Greek designer garments. In collaboration with the Goethe Institute and the Hellenic Foundation for Culture in Berlin, the Hellenic Fashion Designers Association is also organizing the Greek leg of a European young designers competition: “Create Europe: The Fashion Academy Award” will be bestowed in Berlin in October, in collaboration with EUNIC Berlin, an umbrella Association uniting European institutes for culture. Twenty young designers are participating in the final phase of the Greek competition on Sunday, during which a judges panel will select three winners. In collaboration with the French Institute in Athens, the Athenian fashion marathon will end on high fashion note on Sunday night, with a screening of Rodolphe Marconi’s documentary “Karl Lagerfeld: Confidential”. Posted by grhomeboy in Arts Events Greece, Ballet Dance Opera, Stage & Theater. The Griffon Dance Company is staging “One Flesh”, choreographed by Ioanna Portolou, at the company’s studio in Plaka every weekend until the end of March. With spring almost upon us, the Athens dance scene is slowly emerging from hibernation. It won’t be long before the well-established dance festival by the Association of Greek Choreographers takes place once more. Major foreign dance companies including the Nederlands Dans Theater and Diversions of Wales, are expected to perform toward the end of the month. Yet right now the spring’s first shows are being held by two local dance companies. Well-known choreographer Ioanna Portolou and her Griffon Company have this time chosen their studio in Syntagma Square to stage their latest production. Portolou never ceases to amaze the audience with movement inspired by gestures and reflections of daily life as well as special musical choices and interesting clothes. “One Flesh” staged every weekend until the end of March, was inspired by the wedding ritual and explores the concept of that union of lovers. How can two people become one peacefully? To become one, must the other person exist or must they be made to disappear? What is the “male” role and what the “female”? In that role-playing game, what belongs to which parter? All these questions are explored in the performance. Equally interesting questions and suggestions are sought by the newly founded Angeloskoni Dance Company, which will stage Angeliki Papadatou’s “Fotosoma” from March 15 to 18 at the Ledra Theater in Plaka. The production is a joint collaboration by the Athens School of Fine Arts Photography Workshop and Very Special Arts Hellas. Photographers and dancers, some with disabilities, meet on stage and try to find their own identities using the visual and aesthetic perception of their bodies as the starting point. What is our true image? How do we perceive ourselves? How do others see us? These are definitely ideas well worth exploring. Griffon Dance Company, 23 Apollonos Street, Syntagma Square, Athens, tel 6932436034. Ledra Theater, 12 Kekropos Street, Plaka, Athens, tel 210 3245969.